Thousands of products we see on the market every day are made right here in Southwest Florida. 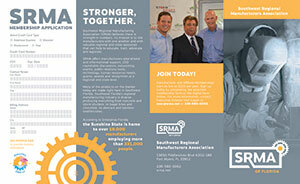 Southwest Regional Manufacturers Association serves as a valuable resource to connect manufacturers that call Southwest Florida home with educational and informational support, CEO roundtable discussions, networking events, public relations tools, human resources needs, grants, awards and recognition at a regional and state level. Southwest Florida’s growing manufacturing industry is diverse, manufacturing everything from concrete and storm shutters to bagel bites and chocolate to skincare and bamboo toothbrushes. According to Enterprise Florida, Florida is home to over 20,000 manufacturers employing more than 331,000 workers.